The open source cloud management tool OpenStack is a fairly new technology. It wasn’t too long ago that cloud computing was still brand new, so it’s not crazy to assume that few people actually understand & utilize OpenStack. 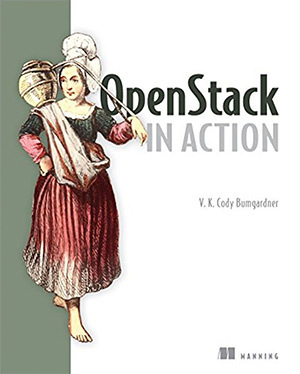 This brings us to OpenStack in Action by V. K. Cody Bumgardner. This book covers real-world case studies and live examples teaching anyone how to start using OpenStack for web projects. This is geared towards server engineers who want to deploy their own cloud platform. But web developers and DevOps people may also be interested. I’d argue that OpenStack in Action is the perfect starting point for anyone that wants to learn OpenStack from scratch. With 385 pages this book is pretty darn long. And I’m genuinely impressed with how much content is crammed into these pages. Don’t worry if some of these terms look completely alien. The author does an incredible job explaining each new concept in detail with examples to follow. 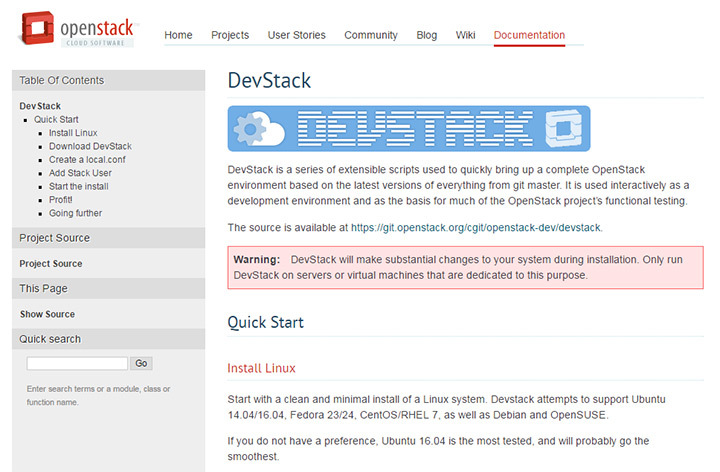 You start by installing OpenStack and getting used to the environment of tools. The author quickly introduces DevStack for testing various ideas locally. A good portion of the OpenStack protocols are explained for custom infrastructure and software services. You’ll also learn about the concept of Infrastructure-as-a-Service(IAAS) and how it applies to OpenStack. In the deployment section you learn about various topics like networking and block storage. OpenStack does have guides like this networking page if you want to learn more yourself. But I think this book teaches everything you need to know to get running quickly. The later chapters get into alternate technologies like Ceph for block storage or Fuel for deployment. Again you do not need to understand any of these things before picking up this book. The author really knows how to lay down practical step-by-step guides for anyone interested in the field. I would argue this is the best and most up-to-date book on OpenStack that you can find. The biggest pro for this book is the style of instruction that forces you to take action. Most technical concepts are extremely confusing in theory and they only “click” in your mind when you put them into practice. OpenStack covers a lot of tools and a lot of technologies. The author has a way of writing that encourages you to keep moving one step at a time. You learn about the physical server hardware and the cloud infrastructure to see how they all fit into the grander scheme. On the downside I think this book can be intimidating to people who don’t have any DevOps or sysadmin experience. Yes you can pick up this book without any prior knowledge. But it certainly helps to understand the basics of server networking, cloud-based hosting, and server infrastructure. This is why system administrators can learn so much from this book: it doesn’t waste any time getting into the details. But the writing style is so clear that it’s hard for me to say this book can’t be for a beginner. Yes you may need to put in extra work to get through it. But the actional steps will force you to consider what you’re doing during setup & configuration of OpenStack. The author has a way with writing and each lessons moves smoothly into the next. I think the content offers a lot of value along with the actual writing style. This book should be a #1 hit for anyone with a background in servers or IT. If you already have some experience with Linux and/or server environments then you’ll have no trouble learning OpenStack from this book. I also think DevOps guys who moved from development into servers & infrastructure will have a lot of fun with this book. With some dev knowledge you get to learn both sides of the equation which can help you see the bigger picture. This book is not for anyone who’s strictly interested in the programming/development side of deployment. OpenStack pushes you to understand cloud infrastructure and if you just want to learn the basics you won’t go far. Plus this book is tutorial-driven meaning you need to follow the steps and do the work to get anywhere. However experience level really doesn’t matter if you’re driven to learn. You can have almost no server management experience and still pick up this book as your first resource into the subject of cloud computing. It will require a lot more effort researching topics to further educate yourself, but it is possible to learn OpenStack from scratch with this book. If you recognize that cloud hosting is the future then you’ll recognize the power of OpenStack. Anyone hoping to learn this new infrastructure should definitely grab a copy of OpenStack in Action and put it to good use. There are no other books that I’d recommend in place of this one. The author’s writing style and teaching style flow naturally making it super easy to follow along. If you do not have server experience you can still pick up this book, however you’ll need to put in extra study time to catch up with subjects you don’t understand. Bottom line this is an easy 5 stars no question. OpenStack in Action teaches you how to work with OpenStack using real-world examples considering situations with common problems you’ll need to solve. I cannot think of a better book on this topic and considering this is also fairly new it’s truly the best learning resource available.